Finding the best personal, small business and military tax software deals, e-filing savings, and the latest tax tips gets easier for consumers at FatWallet. 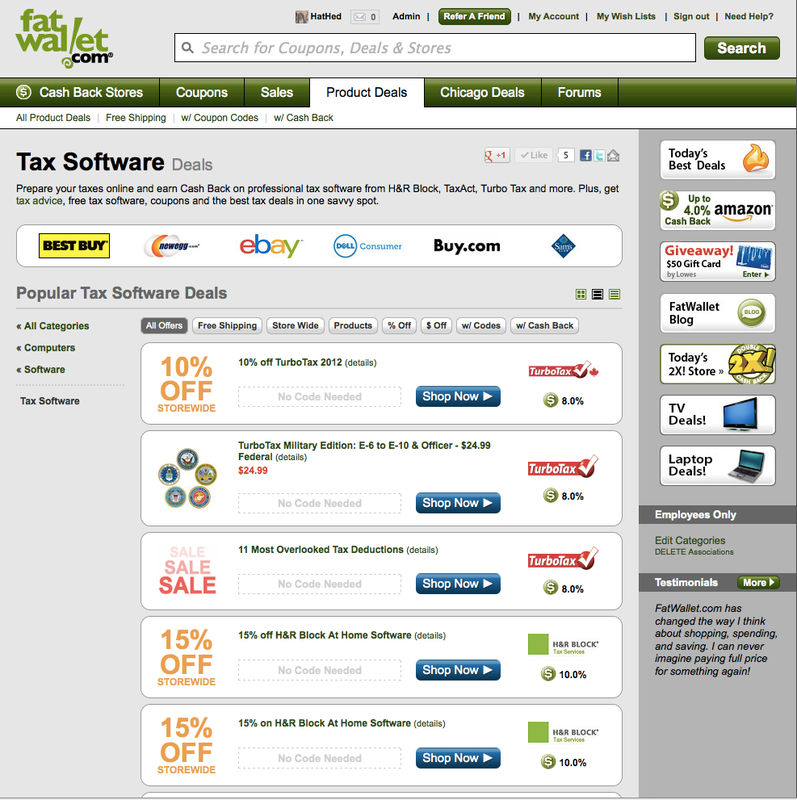 FatWallet.com offers a one-stop shopping solution for the year’s best Tax Software Deals and easy access to savvy crowd-sourced tax tips and advice. The promotional page, along with a comprehensive up-to-the-minute tax software discount summary in the FatWallet Hot Deals forum, features current coupons and offers from top tax software brands, including the lowest available prices on the highest rated tax software packages. The promotion also features additional savings with cash back for FatWallet members from dozens of online resources including H&R Block, TurboTax, TaxAct and Intuit Quickbooks. “Consolidating all of the deals, coupons and available cash back discounts in one location allows consumers to quickly compare their options for tax software solutions,” states FatWallet spokesperson Brent Shelton. “Finding the most relevant tax tips and software purchase advice from savvy financial experts in our forums is another unprecedented benefit to FatWallet users." FatWallet also features a variety of helpful tax-time resources in the FatWallet Blog, including tips for maximizing deductions and utilizing any available tax credits. The highly-regarded FatWallet Finance forum is a vital resource for reviewing detailed tax advice, hosting hundreds of topics and discussions between knowledgeable personal finance experts, CPA’s and small business owners. Topics include options and tactics for home office deductions, working abroad, IRA claims, payroll tax cut tips, scams, state/federal deadlines and 2013 filing news and additions. About FatWallet: As the preferred online shopping resource for millions of smart consumers, FatWallet.com works closely with 1,500+ retailers like HP, Newegg, Walmart and Amazon to publish special offers, discounts, coupon codes and Cash Back rewards to its members. The much celebrated FatWallet forums represent the pulse of an evolving online marketplace where smart consumers gather to share and learn. FatWallet is owned by Performance Marketing Brands (PMB) who owns and operates the world's most rewarding shopping programs. Through its family of distinct websites and reward programs, Ebates.com, FatWallet.com and AnyCoupons.com, PMB users can get a great deal and earn money back every time they shop. PMB shoppers are expected to spend over $2 billion through PMB's websites and shopping programs. To learn more, visit http://www.performancemarketingbrands.com.